black grapes recipe collection. Black grapes (Kala Draksh) are dark purple colored grapes that, like other varieties of grapes, grow in clusters on vines. The fruit is sweet, slightly tangy and rich in antioxidants, vitamin E and other nutrients that help in reducing cholesterol. The color of the grapes are a dark purple which makes them not only fun to eat but also makes the food really appealing. The wonder fruit is makes a for a wonderful juice standalone or combined with something else. Rainbow cocktail is a delightful combination of orange, sweet lime and black grapes with a hint of black salt as a kicker! This is perfect for any party you have, just make sure to serve it with some crushed ice! Similarly there is also a drink called Tangy twist that is vibrant as well as exotic with its combination of grapes and pomegranate. A simple smoothie helps you start your day right. Black grapes and Curd Smoothie is an epic combination that gives you calcium and protein in a good amount at the start of the day! Another fantastic recipe with an Indian touch is the Grape lassi. It's so unique that everyone will be impressed and awestruck by its amazing taste. The most common way to use grapes is to combine it with different fruits and make a Fruit Chaat, typical Indian style, mixed with tons of chaat masala. Black grapes also taste delicious with vegetables like carrots and in a colorful salad, with a curd and mint dressing, something like a Mixed Sprouts, Fruits and Veggie Salad. Raita is the most basic accompaniment to any Indian dish. The great thing about it is that you can add any fruit and vegetable that goes well with curd to add the mix. Strawberry and Black Grapes raita is a perfect combination of sweet and sour together that serves as the perfect palate cleanser during meals. Even though fruit chaat is typically served as an after meal snack but you can turn it into a really cook party starter by serving Fruit Tart Chaat by serving the chaat in little tarts and topping it with a little sev. If you want to know more about the Uses of Black Grapes, then you can check out our article on that. 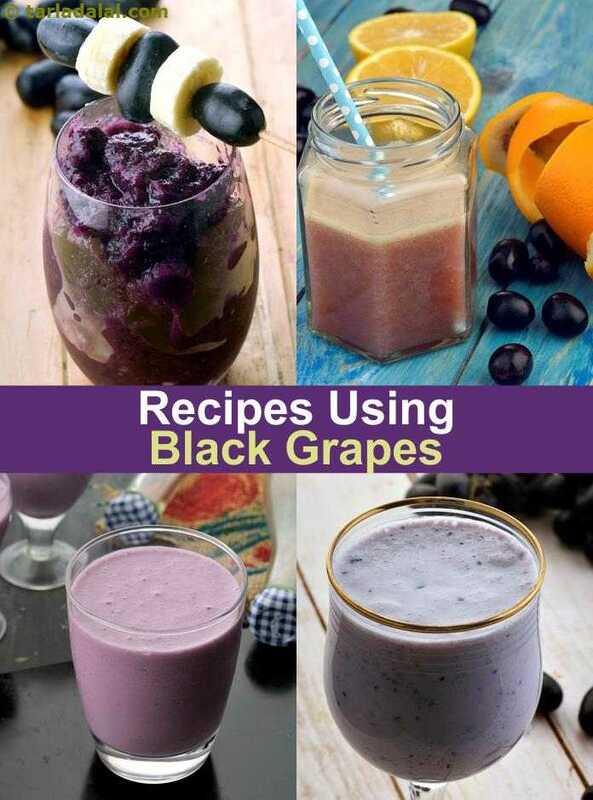 Enjoy our black grape recipes given below. The lovely deep purple colour is enough to entice one and all to go for it. Delicately flavoured with roasted cumin powder and black salt, this granita is sure to perk you up on a hot summer afternoon. Cubes of fresh garden fruits tossed with honey and garnished with fresh mint leaves. For best results serve chilled. Try this novel dish for a party.